Final Thoughts on Germany: At work I keep an audio clip on the computer from Mel Brook’s Young Frankenstein. Okay, it’s on all my computers. It’s the one where Gene Wilder and Teri Garr discuss the giant size of Frankenstein and she says, “he would have an enormous schwanstucker.” I have Googled this word, schwanstucker, several times to see if it’s real. So, while in Germany, I randomly polled local people asking them if they knew the word schwanstucker. Hmmph. Not a single person knew this word. Such are the things that keep me up at night. Attached is a slide show of nearly 200 photos from the trip. Just in case you had absolutely nothing to do with your day today. Leaving Germany, I am in awe. Boy are those vineyards steep. The German market clearly enjoys very dry white wines, yet they are convinced that our domestic US market is not ready for these. Even at my insistence, they explain that every time they bring their road show to the US, they include a few dry examples and no one buys. I can’t blame the winemakers, they are trying. German wines have come so far and yet they are still stuck in our retail. We struggle with this daily at work. I recommend a German Riesling to go with a dish, and the customer has a frown followed by, “but I don’t like sweet wines.” Sometimes even at my near begging to trust me, the wine is dry; the customer refuses to try that bottle. Germany is clearly plagued by the self-fulfilling prophecy. A restaurant assumes the Riesling drinker wants a sweet wine, so they put a sweet wine on the list by the glass. A customer hears that Riesling can be dry, so they order the Riesling and wham, sure enough it’s sweet. Rarely do the dry ones make it to the limelight. 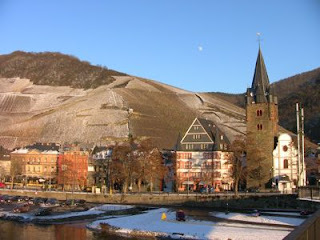 We are devoted to Riesling at Wine Authorities and almost always feature dry versions. I often say that if I were on a desert island, a dry riesling would be a good candidate for my only wine. The “international dry” level means mostly dry. Most of us would taste these wines and say they are pretty much dry vs. sweet. More and more German labels are carrying the term Feinherb for such wines. It’s not quite trocken (dry), but not halb-trocken (off-dry). Derek likes to use the Feinherb translation as “fine dry finish.” You’ll be seeing several Feinherb Rieslings arriving this spring to Wine Authorities. German red wines are about to explode on the market. Or are they? The quality I was tasting from the red grapes Spätburgunder (Pinot Noir), Dornfelder, and St. Laurent was outstanding. Whether it’s global warming or better winemaking, the reds are coming on strong. But is the market ready? Again, the consumer assumes Germany makes only white wines. We have had good luck with selling Dr. Heyden’s Pinot Noir and will continue to bring great wines to our customers even if they are less well known from a region or country. Frank Heyden told me that the entire EU is banning the use of copper sulfate in vineyards farming organically. The catalyst was due to some regions, particularly Bordeaux, having used excessive amounts to combat fungal disease and loaded their soils with copper. However, most organic farmers use the bare minimum necessary and are rarely worry about high levels. So, any farmer certified organic within the last two years is not allowed to purchase copper sulfate. Certified farmers for more than two years, have an opportunity to purchase as much as they want before the ban takes place and use up their copper sulfate for as long as it takes and still maintain their status. So, farmers are buying years worth of the stuff in giant drums. Currently there is no alternative option as a fungicide. Frank said some studies using milk spraying were attempted and the farmers lost all their grapes to fungus. I heard several producers mention a movement away from the glass top, Vinolock. These can get knocked in transit and the seal breaks. Stelvin is still in favor, but many makers are concerned about the age ability of a wine in screw top. The research is still coming. This Diam cork (real cork and plastic combined) may be a solution for those who insist on a cork closure. The absolute best closure is the crown cap, i.e. beer cap, but can you imagine the outrage to that on a $30 bottle of wine? I want to thank Derek Vinnicombe for being my host and driving me all over Germany to visit his estates and for his patience with my many hundreds of questions. I also want to thank the winemakers I met, often in their private homes sitting at their dinner table, who showed me great hospitality, generosity and wonderful wines. I am very committed to sharing the quality and value German wines have to offer our customers in Durham. Next stop, Österreich (Austria), specifically Wien (Vienna). Thanks for continuing to read. Germany & Austria Part V: Confession here, I have too much to say and have had to spread three days of Germany over 5, maybe even 6 blog entries. So I will no longer date the entries, but just label them as parts. Okay, I feel better now. reflecting the warmth by night. These things are often talked about when discussing great vineyards and the vine’s ability to ripen the fruit. The pictures here show snow covered land and then the famous Doctor vineyard in Bernkastle behind the church, see? No snow. The last three wineries Derek and I visit are FK Schmitt, Paul Anheuser and Molitor. We drive the busy roadway along the Rhein river in the city of Nierstein and arrive at the FK Schmit estate in Rheinhessen. It looks just like the label on the bottles, and Franz Karl Schmitt explains the house was built in 1925 post WWII. You may have enjoyed his 2007 Weissherbst (Rosé) this year, especially at Thanksgiving and I am happy to let you know the 2008 is in tank, clarifying right now and will be bottled in two weeks. We sit in a small parlor with the wine samples and his cat watching from a room across the hall. 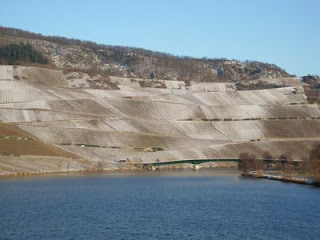 Franz Karl talks of his vineyards being on “the red slope” referring to the red decomposing rock we see along the river. This red rock is the primary reason we love Rheinhessen’s acidity. 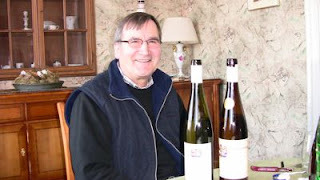 He also produces wines from the grand cru vineyard, Niersteiner Hipping. We taste the 2007 Hipping and it is truly excellent, although a bit backwards at this very early stage of life. I look forward to retasting this wine down the road. We work through just six wines, and I have my highest “buy” ratio, preferring 5 of the 6 wines as possible vintages for the store. In fairness, the sixth was a 1997 vintage bottle, no longer available for purchase, but to show me how his wines age. FK is a big fan of Diam cork. This brand is a blend from 70% natural cork chopped up like a minced onion and 30% plastic pressed under high heat to form the cork shape. It is guaranteed to be bacteria free and therefore no cork taint can occur to the wine. FK is losing faith in the plastic No macorc because he says after about 5 years the plastic corks are loosing resiliency and becoming loose in the bottle necks. 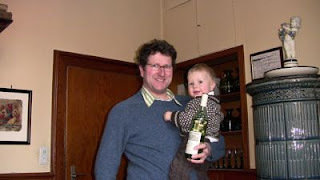 Before we leave, FK asks me for a recommendation in bottling his 2008 Hipping vineyard Spätlese. I am sort of awestruck as I think, who am I to tell YOU what to do. The question is, how much of the 2008 vintage should he bottle as a truly dry wine and how much to bottle with some residual sweetness? Alert, here come the politics of wine! Here’s a look behind the curtain of the great and powerful Oz. FK wants to know what I have heard from the US press regarding the 2008 German vintage. Winemakers have to make critical decisions, sometimes not based on the wines, but on simple economics and I can’t blame him. He has to pay his bills. 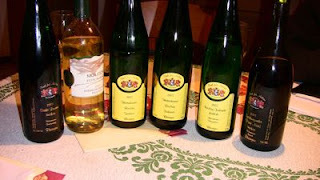 Germans prefer truly trocken (dry) wines. I mean really dry. Surprised? And the rest of the world, i.e. the US being the usual reference, says they want dry, but actually the wines with some residual sugar are preferred. (I continue to blame this on a little blue Nun) The Germans refer to this type of dry as “International Dry.” FK has to make a decision at bottling where if the press is loving the 2008 vintage, then he will need to bottle much more of this wine with some “süss-reserve” or a bit of unfermented auslese grape juice to take the dryness out to meet the export demand. If the press pans the vintage, he will have to sell the majority of his wines at home and they will need to be very dry. What a gamble! I’d hate to be in his shoes. So I politely say that I haven’t heard much about 2008 from the press yet. The truth is that I haven’t. In the car I am lost in thought about this economically driven decisions a winemarker is forced to deal make which have nothing to do with quality or their personal preference. I guess if cream soups sell better, the chef has to keep the cream of broccoli on the menu. Into the Nahe we drive toward Paul Anheuser’s estate. We sit in a very cold, old home and taste through loads of wine with Paul, his mother Dorothee and his baby son and next generation, Jakob. I have to keep my jacket across my legs to stay warm and slowly nudge my chair back from the table toward the barely luke warm radiator behind me. I am sort of curious why no one else is shivering today. Must be my thinned NC blood. best seller at Wine Authorities later this year. Paul and his mom treat us to some afternoon coffee, cake and wine. 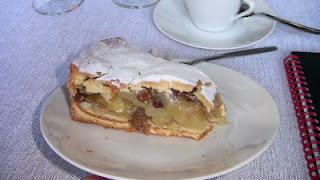 I have the apple strudel type thing and want to try the Amaretto and chocolate, but have to pace myself. 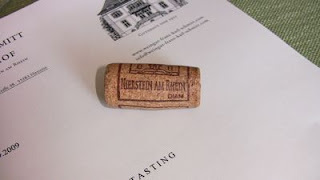 The final German leg takes me to the Rheingau region to visit the Molitor estate. Klaus Molitor is on a ski holiday, so we are treated to the company of his father and mother Rosel & Karl Molitor. 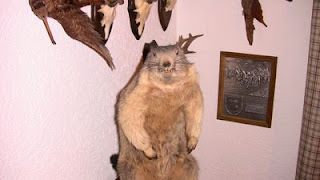 Karl is a hunter and we sit in the tasting area surrounded by more horns, tusks and creepy grinning stuffed animals than I am used to. The 2007 vintage in the Rheingau was challenging. Many farmers were fearful of rains coming and ruining the vintage, so they picked early, too early, leaving too much acid and unripe flavors in their wines. Molitor, waiting until late October for physiological ripeness, achieved great flavors and balanced wines. It was risky, but worked. One of the tasting highlights is a Riesling Trocken, Edition René. I am hoping we can bring this to the US market exclusively. this will do just fine. I guess I missed the word Béarnaise in her German accent, something I would normally pass on for health reasons. 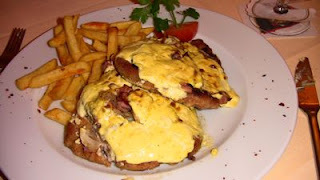 I am treated to the most juicy pork cutlet with sautéed onions and ham, smothered in tarragon herbed Hollandaise sauce. 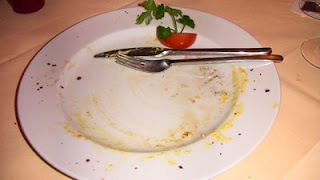 My cholesterol surely shot up 100 points that night and Derek politely watched me all but lick the plate. Derek drops me back in Frankfurt at the airport, and I leave for Austria that evening.